Ralph Lawler, former Philadelphia broadcaster, who is retiring after 40 seasons with the Los Angeles Clippers. The Los Angeles Clippers are in Philadelphia on Thursday night at the Wells Fargo Center and a legend comes with them for his final professional ride through town. Chances are he will recognize the city. 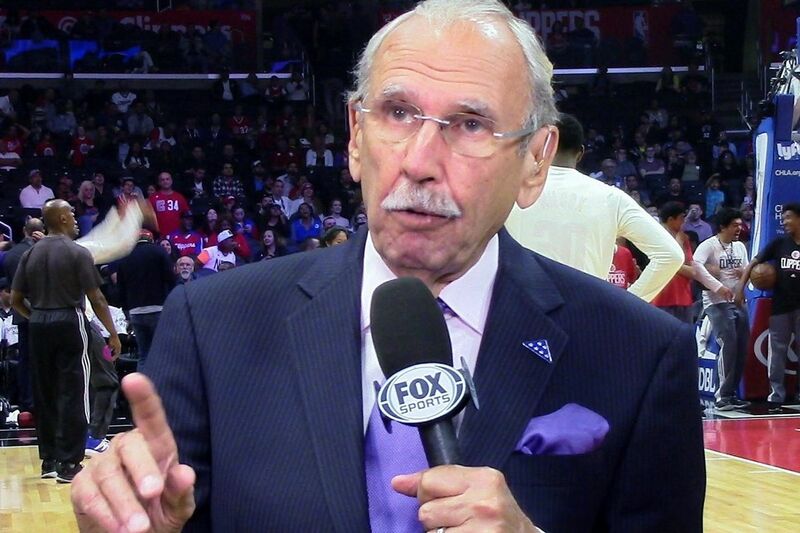 That's not just because Ralph Lawler has been the broadcast voice of the Clippers for 40 seasons — a man who has shared more bad news with southern California than a shark-spotting lifeguard — but because he got his big break in Philly and hasn't forgotten those roots. Lawler, 80, the play-by-play announcer for Fox Sports West/Prime Ticket, is retiring after this season. He's doing one more tour around the league and then calling it quits, with a much more successful lifetime record than the team he has chronicled through four decades. "I love what I do. We had a season where we won 12 and lost 70, and I had 82 great nights. I really did. Some nights if the team loses, my wife will be upset because she's the greatest fan, but if I had a great broadcast, I'd be like, 'Hey, we really kicked it tonight,' " Lawler said earlier this week, as he prepared for a Tuesday game in Oklahoma City. "I can't control winning or losing, but I have some control over how entertaining or informing a broadcast is. That's my job and that's what's going to give me satisfaction." Well, that's the attitude to have if you're going to watch the Clippers for 40 years, although Lawler has been rewarded in the last seven seasons with the most consistent stretch of winning in franchise history. Preceding that, it was a bit bleak. The Clippers had two winning seasons in a 32-year stretch between 1979-80 and 2010-11. Along the way, however, Lawler became a Los Angeles mainstay in a town that changes its fashion with every fresh breeze off the ocean. (Interestingly, the same was said of former Lakers' announcer Chick Hearn.) Ralph coined "Lawlerisms" that entered the local lexicon and he still punctuates dramatic turns with an iconic, "Oh me, oh my!" With the Clippers, there was always a reason to use that one. Ralph Lawler, left, in his first season with the Clippers, 1978-79. The head coach is Gene Shue and, on his left, assistant coach Bob Weiss. "If I can keep people listening into the fourth quarter of a 20-point blowout, whether a win or a loss, I've done my job that night," Lawler said. Lawler is from Peoria, Ill., attended Bradley University, and got his first broadcasting gig at a little station in Riverside, Calif. At the age of 36 in 1974, he landed a job with WCAU radio in Philadelphia, and was soon to expand his role by also joining PRISM, the area's first sports cable-TV venture. "I was there until 1978 and those were the four defining years of my career," Lawler said. "I didn't know much about Philly aside from the cold winters and the W.C. Fields jokes, but the job was too good to pass up. WCAU was a 50,000-watt clear channel radio station that my parents could sit and listen to in Peoria. That was a thrill coming from a little teapot station." The thrills during his stay included covering or announcing the Phillies, Flyers and 76ers, along with Villanova basketball, Temple football, Big Five games from the Palestra, and all the attendant hoopla of the Bicentennial, which included the baseball, hockey and basketball All-Star games. Throw in the NCAA Final Four, a Stanley Cup, a trip to the NBA Finals and it wasn't bad. "I did WCAU radio during the week and was the weekend sports guy on the TV station, and then did PRISM stuff every free night. I worked all the time," Lawler said, "but I was young, strong and eager and it was a great time professionally." His work got him noticed, and he returned to California to be the voice of the Clippers when the franchise moved from Buffalo (the Braves) to San Diego for six seasons before relocating in Los Angeles. He brought along with him one of his most-quoted catch phrases, which has become known as Lawler's Law: "The first team to 100 points always wins." He borrowed that from legendary Sixers trainer and raconteur Al Domenico. "Al used to say that all the time. I thought, 'I'll steal that and make it alliterative,' Lawler's Law. If I leave any legacy behind, that's what it will be," Lawler said. "I hear it all around the league from coaches and general managers and players and fans. Someone scores 100 and there's Lawler's Law. It's been fun." Yes, it's been quite a ride. Among the coaches he's worked with, there were a number of Philadelphia connections, starting with Gene Shue ("It's a crime he's not in the Hall of Fame"), Jim Lynam, Don Casey and Larry Brown. His broadcast partners have included Bill Walton, Mike Fratello, Hubie Brown, and J.R. Bridgeman, which is proof that even bad teams can get good help if you also get SoCal in the bargain. To this day, Lawler works without a headset, preferring a handheld microphone. He says he doesn't know what to do with his hands if he doesn't. His wife, Jo, attends every game, home and road, and that is a road that has only a little over five months to go, give or take for the playoffs. Speaking of which, during Lawler's tenure, the Clippers have never reached the conference finals, let alone a league championship round. They have made the playoffs 10 times in his 40 seasons and won a total of four rounds. "I got spoiled in that Philly run. The Flyers in the Stanley Cup and the Sixers in the NBA Finals," Lawler said. "I said, 'Hey, this is fun.' "
Now, he's back Thursday night for one more look around. Ralph Lawler, who as a young man told Philadelphia about Bernie Parent and Julius Erving, about Rory Sparrow and Mike Schmidt, back to hold that microphone close again and tell us what he sees and what he has seen.